Fibre rush (imitation or synthetic rush) is a loosely twisted paper cord that comes in a variety of widths and colors. Very durable and long lasting. Used primarily for seats but also found in Early American wicker furniture. 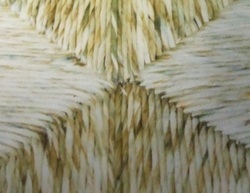 Genuine rush is flattened cattail leaves hand twisted into a continuous strand. An overwrap of wheat is also done for a beautiful gold effect referred to as French Rush. We harvest our own cattail each year. 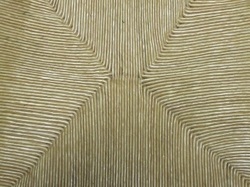 French Rush has a wrap of wheat around a core imparting a bright gold tone. This can be done with cattail rush or pretwisted seagrass. Seagrass rush is a pretwisted rush using seagrass that gives the natural look without the price of genuine rush. 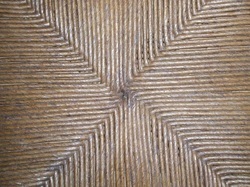 This pattern is typical of furniture from Mexico. 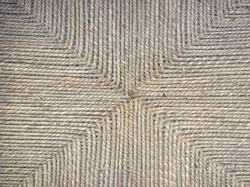 Twisted seagrass is a 2-ply grass twisted to give a rope like feel. Comes in a variety of widths and is also used in other misc. weaves. 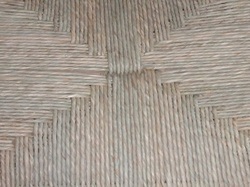 Rush is one of the oldest seating material dating back to Egyptian times. Today there are many materials to select from such as paper, cattail, grass, raffia, corn husk and resin, to name a few. Most are very tough and serviceable, making this form of seating one of the best for the dollar spent. With all the different materials, weaves, and color combinations possible, you can personalize your own chair. Contact us so we may help you with your repair or if you just want material for your project.